The nature of your job as a firefighter requires that your turnout gear provides protection against the hazards you encounter, so the National Fire Protection Association (NFPA) has developed standards that specify the minimum level of protection and performance that your gear should provide. However, the conditions your department faces may be different from those of another department. The best way that firefighters have ensured that they have the right turnout gear for their department has been through wear trials. Until recently most wear trials usually have not included hoods. If your department was very large, a hood manufacturer might have offered a wear trial as a means to introduce a hood with a new feature or one that improved thermal protection. But in general, once you found a hood you liked, you bought the same one every time — like a commodity, for $25 to $30. Some departments may not define specifications for hoods. Why Is a Wear Trial Important Now? With the introduction of the Particulate-Blocking option for hoods in the 2018 Edition of the NFPA 1971 Standard, hoods have changed. Many more options are available, and the fact that the price of particulate-blocking hoods ranges from $80 to as much as $150 or more, means an informed purchase decision requires more thought and information rather than just buying the same hood you have always bought. This type of information can best be gained through a wear trial. When you are preparing for a wear trial of turnout gear, you usually think about why you want to participate in a wear trial. It is time-consuming, but the results are very helpful when you are purchasing gear that you will be wearing for the next several years, sometimes as long as ten years. Although you won’t necessarily be wearing these hoods for ten years, this is the same process — it is new and unfamiliar gear that you will be wearing, so you need to try it out. Just like turnout gear, manufacturers have developed particulate-blocking hoods with different designs and constructions. 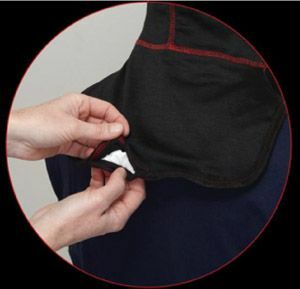 For example, some particulate hoods are designed with protective barriers in selective areas of the hood — such as around the neck and ears — while others have protective barriers throughout the entire hood. The materials used for the particulate-blocking barriers are newly designed, often ones that you have not seen before, so you should evaluate these in the environments where you work. What Should We Consider for a Hood Wear Trial? How do we set up a wear trial, and what will it cost? For most departments, the easiest approach would be to check with your dealer. For example, Gore offers a free wear trial through any Majestic authorized dealers to departments with at least 50 firefighters (any combination of paid and volunteer). How long should a hood trial last? This varies depending on how frequently you respond to structural fires. You want to be sure to have sufficient wear time to evaluate the hood’s performance in most of the conditions where you expect to be operating, but Gore’s trial experience is currently indicating that solid evaluations can be completed within six months or less. Many industry professionals are now recommending that hoods be washed after every call, which translates to the need for durability. Whether you need a hood that just meets the minimum testing requirements or goes beyond them depends on your specific needs. For example, if you are dealing with structural fires weekly versus every three months on average, durability is more important for you. So you should be sure to check the hood’s ability to withstand multiple laundry cycles typical to those required by your station protocols and its call frequency. What do we do with the hoods after the trial? Again, this varies depending on the manufacturer responsible for the wear trial. For example, Gore conveniently allows the wear trial participants to keep the hoods and only asks that each participant return the evaluation form at the end of the trial. Again, as turnout gear became more sophisticated with more options, it became crucial for departments to try gear out to ensure that they were selecting the right products for them. Likewise, all certified particulate-blocking hoods are not the same, and the investment is more significant, so a wear trial is more critical for determining which particulate-blocking hood is the right choice for you. To learn more about the Gore Wear Trial program, contact an authorized Majestic Fire Apparel dealer and ask them to request a trial at gorehoods.com.